Full disclosure - Amy from The Trendy Reader is my friend! But I didn't tell her I was writing this feature...surprise, girl! We met via social media at a Windy City Bloggers photography workshop. The Chicago social media community is actually pretty small and the book blogger community is even smaller. We had been following each other for awhile but that was the first time we had a chance to meet. And we've been book besties ever since! I admire Amy's style, her choice of books, and her willingness to share her blogging wisdom with me. She's a ton of fun to hang out with in real life and always upbeat and positive! Abby from Crime by the Book is a legit bookstagrammer with over 49,000 followers on Instagram and several awards for her blog. Her black and white style matches my own aesthetic and she always has delicious arm candy (check out that stack of bracelets!) She is based out of NYC and works in publishing. Follow this account for great latte art, as well - she's covering a lot of my favorites (B&W, fashion, coffee...) If you prefer murder mysteries/crime novels/suspense...then this is the girl to follow! For the longest time I followed Reese Witherspoon exclusively for her book recommendations. Overtime I enjoyed her other posts about her fashion line, Draper James, and her everyday life shots. But not too long ago, a separate Instagram account, reesesbookclubxhellosunshine popped up exclusively dedicated to her book recommendations and now I'm hooked to both accounts! Reese Witherspoon focuses on newly published books that are VERY popular. If you want to know what everyone else is reading and talking about right now, follow this account! Anne Bogel is the blogger behind Modern Mrs. Darcy and author of Reading People. 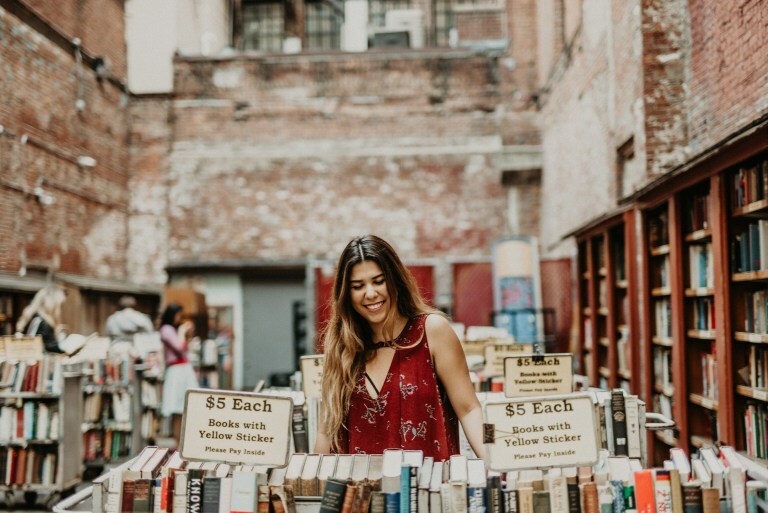 Although her Instagram account is primarily centered around books, it also includes some more lifestyle images such as pics of her home, posts about classes she's taking, and scenic views. What I like most about her blog is her unique approach and clear niche to book blogging. Here's what she says about her blog, "I started this site to explore what it looks like to be an accomplished woman in our modern world...My goal is to put a timely spin on timeless women’s issues–from relationships & family to beauty & style to the modern woman’s role in the changing work place..."
For the life of me I can't remember how I originally found Hopeless Book Lover - but I really enjoy seeing her pics pop up on my feed! She has a great mix of books, food, travel, coffee, book stores and more. Her photos are artfully done and offer plenty of inspiration for new books to read. She's based out of Miami and her colorful photos reflect that. She seems like a ton of fun to hang out with (look at that smile!) and we have similar tastes in books. She also has a great series called #Behindthebookstagrammer which features other Bookstragrammers if you're looking for more to follow!